We currently recommend: `nvidia-361`, Nvidia’s current long lived branch. – Investigating how to bring this goodness to distro on a cadence. This PPA is currently in testing, you should be experienced with packaging before you dive in here. Give us a few days to sort out the kinks. Then restart the deep learning pc and load the NVIDIA drivers. Not enough space on parition mounted at /. Disk space check has failed. Installation cannot continue. Very important, If you answer yes, the GTX 1080 367 driver will be overwritten. A massive, shared code repository, in which all software is built from source. Bazel has been built for speed, using both caching and parallelism to achieve this. Bazel is critical to Google’s ability to continue to scale its software development practices as the company grows. An emphasis on automated testing and releases. Bazel has been built for correctness and reproducibility, meaning that a build performed on a continuous build machine or in a release pipeline will generate bitwise-identical outputs to those generated on a developer’s machine. Language and platform diversity. Bazel’s architecture is general enough to support many different programming languages within Google, and can be used to build both client and server software targeting multiple architectures from the same underlying codebase. from the filesystem (previously, this flag had no effect on OS X). of skylark sets are sufficiently different from python sets. – –objc_generate_debug_symbols is now deprecated. – new_objc_provider can now set the USES_SWIFT flag. – objc_framework now supports dynamic frameworks. – Adds “jre_deps” attribute to j2objc_library. (“fat”) objc/cc binaries and libraries, targeting ios platforms. can only be accessed through fields in a ‘target’ object. See http://bazel.io/docs/getting-started.html to start a new project! ERROR: It appears that the development version of libcurl is not available. Please install the libcurl3-dev package. Now, just enjoy TensorFlow in your Ubuntu 16.04 system with GeForce GTX 1080. There is an error in your example. //#error — unsupported GNU version! ERROR: /home/ei/github/test/tensorflow/tensorflow/contrib/session_bundle/BUILD:237:1: no such target ‘//tensorflow/core:meta_graph_portable_proto’: target ‘meta_graph_portable_proto’ not declared in package ‘tensorflow/core’ defined by /home/ei/github/test/tensorflow/tensorflow/core/BUILD and referenced by ‘//tensorflow/contrib/session_bundle:signature_lite’. ERROR: /home/ei/github/test/tensorflow/tensorflow/core/BUILD:689:1: no such package ‘base’: BUILD file not found on package path and referenced by ‘//tensorflow/core:ios_tensorflow_test_lib’. ERROR: Evaluation of query “deps((//… union @bazel_tools//tools/jdk:toolchain))” failed: errors were encountered while computing transitive closure. GTX 1080, i7 6800k, 32 GB RAM, Kingoston SSD etc. When I run any training code (CNN, LSTM, GRU etc.) I can’t get higher GPU Utilizations than 50%, mostly it just stays at ~32%. Do you face similar issues ? Is it really an issue ? Could you please share your results and/or give any hints ? Just wanted to repeat performance test again of GTX 1080 and got “Ran out of memory” error. Something is clearly not right with either Tensorflow, Cuda or GTX itself. Got it running after killing other Tensorflow sessions, shouldn’t new process of overtake GPU memory when others are not running ? Ok, maybe it’s jupyters fault. Anyway with code above I finally got results, utilization is around 60%. It’s not that bad but still not 100% utilization which I’m expecting. When training LSTM GPU utilization is half of that. P.S. In both cases Used Dedicated Memory is 98% if that changes anything. If you see that message “error while loading shared libraries: libcudart.so.8.0” when excute the tensorflow tutorials sample. You add to “–genrule_strategy=standalone” to solve the problem, like below. sorry, it should be --use_gpu，I have fix it in the post. 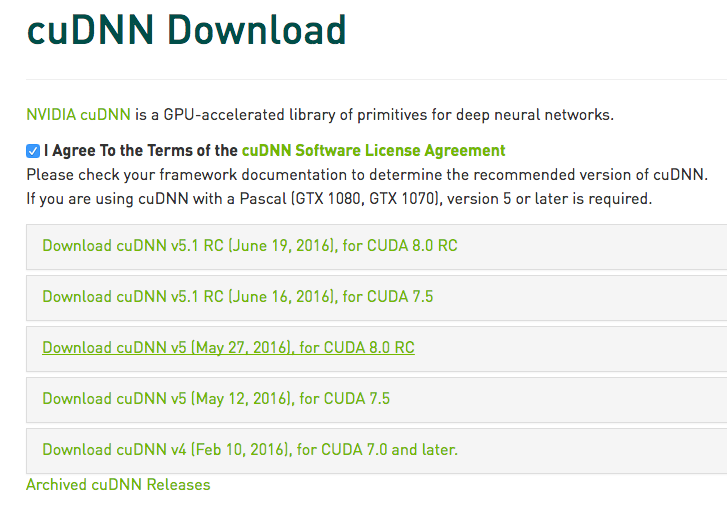 One of the best tutorials for CUDA+cuDNN+TensorFlow. Using Bazel 0.3.2 resolves this issue on my side. “***WARNING: Incomplete installation! This installation did not install the CUDA Driver. A driver of version at least 361.00 is required for CUDA 8.0 functionality to work. Can you just ignore it? It seems an important warning, or not? Thanks for this guide. 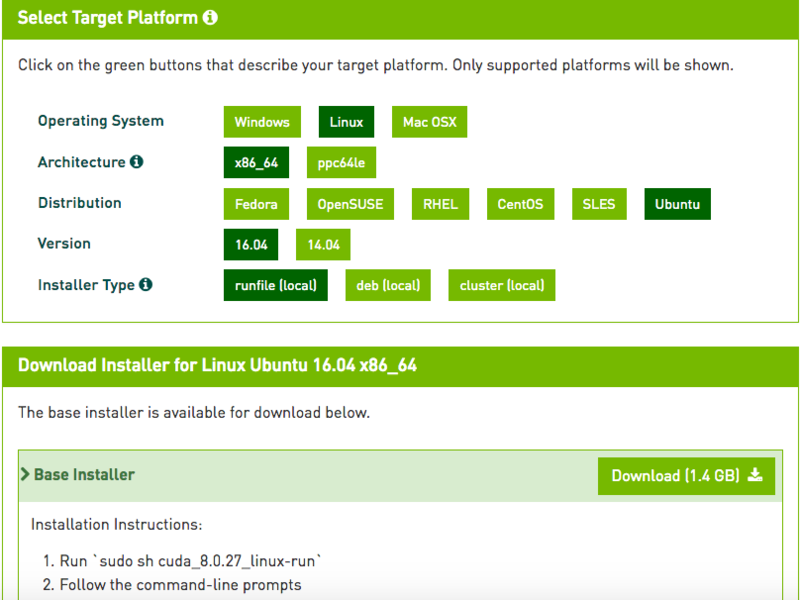 It has made it easier for us to install CUDA cores drivers. Installed latest zlib1g-dev and my PATH variable is correctly pointing to gcc includes. If you only install CPU version tensorflow, why not install it by pip? This is some hard stuff but this tutorial makes it so easy. This is easily one of the best, most thorough, tutorials I’ve ever seen. After installed the CUDA8, I tested nvidia-smi, it didn’t work. The error was “NVIDIA-SMI has failed because it couldn’t communicate with the NVIDIA driver. Make sure that the latest NVIDIA driver is installed and running.” And I followed this instruction https://github.com/BVLC/caffe/issues/1092 to reboot and it worked. Also remind, you need to download bazel 4.5.0 or later to support the latest tensorflow. Have a question, I use ipython3 and can import tensorflow as tf, but I can’t use the package inside. What if I like to setup GTX 1080 card with my macbook? (if I connect the card in separate casing external to macbook via thunderbird port). Is it compatible with MacOS?